Since the early centuries, Christians have held up the saints as models of living the Gospel of Jesus Christ. While the church officially recognizes a relatively small number of saints, the actual roster is infinitely wider. 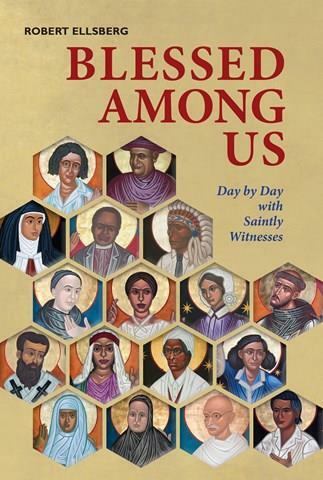 Blessed Among Us explores this eclectic "cloud of witnesses"—lay and religious, single and married, canonized and not, and even non-Christians whose faith and wisdom may illuminate our path. Brought to life in the evocative storytelling of Robert Ellsberg, they inspire the moral imagination and give witness to the myriad ways of holiness. In two stories per day for a full calendar year, Ellsberg sketches figures from biblical times to the present age and from all corners of this world—ordinary figures whose extraordinary lives point to the new age in the world to come. Blessed Among Us is drawn from Ellsberg's acclaimed column of the same name in Give Us This Day, a monthly resource for daily prayer published by Liturgical Press. Robert Ellsberg is the publisher and editor-in-chief of Orbis Books and the author of several award-winning books, including All Saints: Daily Reflections on Saints, Prophets, and Witnesses for Our Time; Blessed Among All Women; and The Saints' Guide to Happiness.